Bins hold all the clips used in a project, and may be organized into folders. A set of default bins exist in every project. These bins cannot be renamed, deleted, or created manually. When a clip is loaded or created, it is automatically added to one of the default bins. Default bins will not hold clips other than the types specified. e.g., An audio clip cannot be moved into the Video Files bin. * The Video Recordings, and Audio Recordings bins are custom bins (see below), that will be automatically added if you perform a related action. eg Capturing Video. Custom bins can have any name and can hold any type of clip. There are no custom bins in a new project but any number of them can be created. They can be used to organize clips. For example, by scene or location. 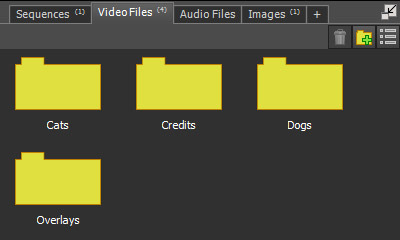 Folders can be created in bins, to further organize clips. Folders cannot contain other folders. Drag and drop can be used to move clips between bins, by dropping them on to a bin tab, providing the bin is able to hold clips of that type. (See above.) Drag and drop can also be used to move clips into or out of a folder.